As we see from his Proverbs, the great King Solomon’s words for successful money management are simple: acquire wisdom, act prudently and plan for long term gain. And those ageless principles are echoed in the words of today’s market watchers, who weigh in from a variety of perspectives with advice remarkably similar to that of the King. “Speculation is an effort, probably unsuccessful, to turn a title money into a lot. Investment is an effort . . . to prevent a lot of money from becoming a little.” –- Fred Schwed, Jr.
Where are the Customers’ Yachts? Or a Good Hard Look at Wall Street. 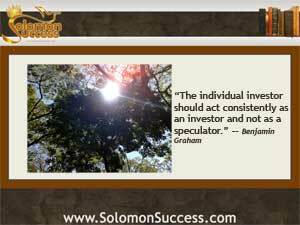 “The individual investor should act consistently as an investor and not as a speculator.” — Benjamin Graham. “Thou shalt not gamble. Be a prudent long-term value investor, never a get rich quick gambler, speculator or flipper.” — Jason Hartman, Commandment 5 of the 10 Commandments for Successful Investing. Join Jason Hartman and his team of investing experts in Austin TX on September 28, 2013 for the one day Austin Executive Property Tour of hot investment properties in Austin’s thriving economy. For more information, click here.